As a kid, you love them. As a parent, well, I’m about ready to throw them all out and just give each kid an iPad. In our last house, I didn’t have much room in the kids’ rooms for toys. But I did happen to have a nice walk-in hall closet. I also had two other small hall closets that I decided to make do for all my linens, so I turned the 4′ x 4′ walk-in closet into a TOY CLOSET! Pretty much ALL of the kids’ toys went into the closet. It was great because behind those closed doors, even if it was a little messy at times, I didn’t have multicolored toy bins staring me in the face. I liked the idea so much that in my new house I decided to have some of the kids share a bedroom just to make another bedroom into an exclusive guest room / toy room. You can see that this is a regular “reach-in” style closet. I didn’t even take out the hanging bar (yet!). But some inexpensive shelving from the home improvement store and some plastic toy bins have saved my sanity! I also like to keep the bins labeled. And the hanging bars for dress up are the same ones I have for towels in my bathroom. What a lifesaver! I do have a few things in the bedrooms, but they are also behind closed doors or out of sight (one box under a bed). If I have friends over with little kids, the bedrooms can just be locked so they stay out of the breakable toys, and just the toy room can be used. In a later post I’ll share how I use this as a guest room as well. Do you have a space dedicated for toys? What do you do? I’d love to hear from you! 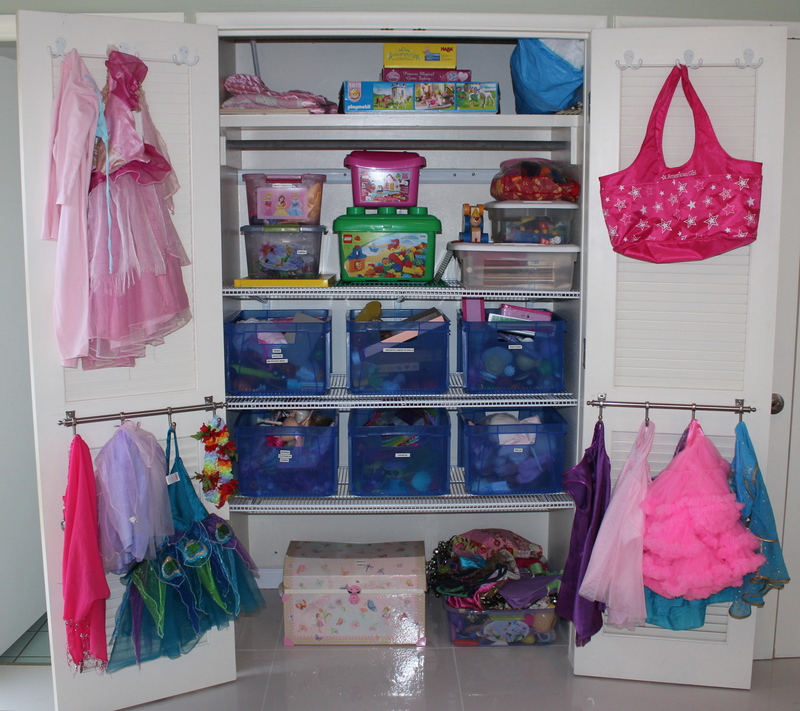 This entry was posted in Bedroom, Closet, Crafts, Home Organizing, Kids, Kids Rooms, Toys and tagged closet, kids, organize, storage, toy closet by organizedohana. Bookmark the permalink. Wow! That looks awesome. I used to keep toys in our guest bedroom, but then the kids never played with them because we were always too busy or tired to go get out things for them to play. They had lots in their room, so they reverted to those. I ended up putting them back. I love your closet where everything is accessable! Will you please link this up on my Making Space Mondays linky. http://www.debtfreemommyblog.blogspot.com.? I LOVE how you have a cloet dedicated to just toys! It’s the perfect way to keep bedrooms looking clean and simple. I need to help my sister hide away all of my nephew’s toys! Thanks for the idea. I love the hanging bars! Where did you find those? They are from Target, believe it or not! I use them in the bathroom too.